paranormal | Larry Atchley, Jr. This post is long overdue, considering I attended this convention way back in the end of March. But better late than never I always say. The Nightmare Machine 2012 was a steampunk convention with a paranormal theme. It was created and organized by Steampunk Illumination Society. It took place March 30th through April 1st, in Jefferson, Texas which is purported to be the most haunted town in the Lone Star State. Whether it is or not is hotly debated amongst skeptics and believers. But it certainly is one of the most well preserved. By setting this event in and around the historic downtown district of Jefferson, it already set it apart from all other cons which typically take place within the confines of a hotel. Some of the activities included in this event included a steamboat ride, which I missed because I got into Jefferson too late Friday, a steam train ride, which i didn’t get to go on because the train derailed a couple of hours before my scheduled ticket reservation and the tracks had to be repaired. They did get the tracks repaired later that day and honored the earlier tickets for a ride that night, but I chose not to go, because I was busy attending other events at the time. The other activity that I did go on was the ghost walk tour of the haunted hotspots in Jefferson. Guide Jodi Breckenridge was extremly knowledgable and shared some great stories about the history of Jefferson’s haunted past. I was fortunate to be asked to this convention as a guest author and panelist which meant that I got to read my story, “Remember, Remember, Hell in November” from the Heroes in Hell series anthology, Lawyers in Hell, in front of a small but attentive audience. Thanks especially to Elizabeth and Mike Stewart who attended and were great to meet and talk to about writing. They had heard about me from a mutual friend of ours, Mike Badolato, who suggested they might like to hear my reading. Thanks for promoting me, Mike! Also at the reading was someone who I greatly admire as a musician, songwriter, and vocalist, Darwin Prophet . Thanks also to everyone else who attended my reading, sorry if I didn’t catch your names to put in this blog, but your show of support was appreciated. Saturday night was an incredible festival of splendid sound called “A Symphonic Celebration”. The featured bands were Marquis of Vaudeville, My Wooden Leg, Sarasvati Bodhisattva, Darwin Prophet & the Chronus Mirror, and BB Blackdog. All were wonderful and brought their own unique style of music to the concert. Earlier that day, my favorited band, Darwin Prophet & the Chronus Mirror played a special acoustic performance of songs from their album, Oscar Wilde’s Serenade, in front of the Excelsior House Hotel. It was a lovely and moving tribute to the poetic works of Oscar Wilde who had stayed at the Excelsior House once during his travels through Texas. I got to hold a discussion panel/presentation on the history of paranormal investigating, procedures and equipment which was fun. Thanks to those who attended, including Larry and Tina Amyett, and Jonathan Morgan. Larry and Tina from North Texas Dieselpunks did a presentation later that day on the history of Dieselpunk that was really cool and informative. These panels were held at the Museum of Measurement & Time which was an interesting place and the owners are very nice people. Other various fun events included the premier of the short film “Mechanical Grave” and the Late Night Social and Tea Duelling put on by the members of the band BB Blackdog. I did a little tea duelling myself, although I lost my round, so I need to practice more. I think I’m better at drinking tea than dueling with it. If you wonder what exactly tea duelling is, this is a good web page that explains it here. There were many other panels on things like sword fencing, making Steampunk costumes, real tales of ghostly experiences and more. There were also several vendors selling all manner of steampunk themed stuff, from costumes, weapons, accesories, art, and music. I want to especially thank Stephanie Moran of the Steampunk Illumination Society for making me a part of this very special and historic event. Thanks to everyone at the S.I.S. for putting on a great and memorable convention that was one of a kind, like no other I have attended. Even the event badges were unique, as they were made out of engraved brass plates. I met a lot of wonderful people, had tons of fun, saw some great sites around Jefferson, and made many new friends. As always, it’s been too long since my last post. I have some new and exciting things to report this time around though. First of all, I have been made co-host of a live broadcast internet radio show called Pairanormal, on TMV Cafe, along with EW Bradfute, and Pamela Jones. We discuss all topics that pertain to the paranormal field: ESP, psychic abilities, ghosts, UFO’s, Cryptozoology. We even delve into stuff like urban legends, conspiracy theories, and zombies! No topic is safe from the Pairanormals! Tune in every Friday night at 9:00 PM Central Standard Time at www.tmvcafe.com. Log into the chatroom and become part of the action, interacting with us hosts and all the other listeners. And if you miss an episode, we archive every show on podcast, so you can catch it later. But I recommend tuning in live so you can have fun in the chatroom with us on Friday nights. See you there! The second announcement is that the promo ad for the latest anthology in the shared world series, Heroes in Hell, is out and all over the world wide web! 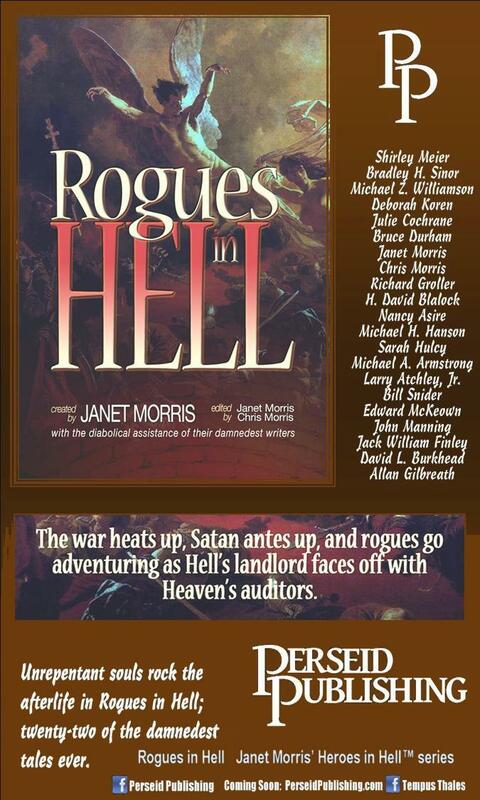 Yours truly has a story included in the book Rogues in Hell, called “Ragnarok and Roll” that will take you on a wild ride through Hell! A couple of familiar characters from Lawyers in Hell, Anton LaVey and Guy Fawkes team up with some new damned souls, namely The Red Baron, Erik the Red, Leif Eriksson and a band of other famous vikings on this latest infernal adventure. I am honored to share space in this anthology with some of the best damned writers in fiction. 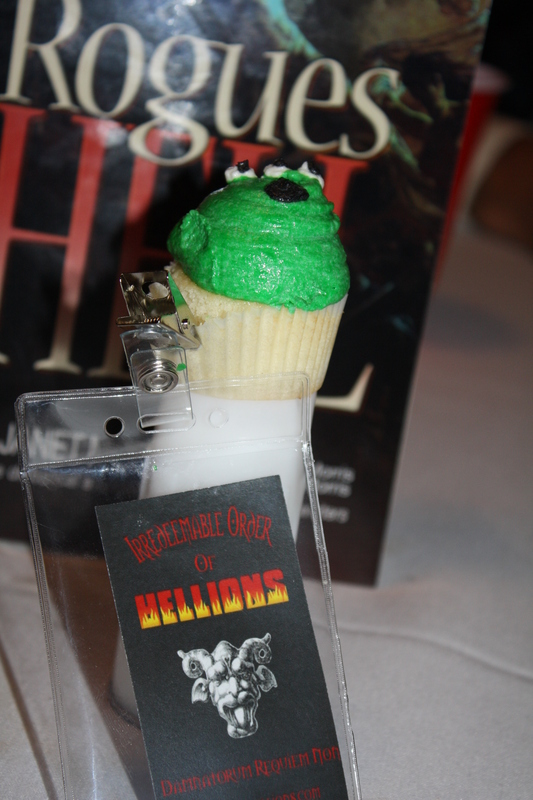 Special thanks as always to series creators and editors, Janet Morris and Chris Morris for making me a part of the crew of Hellion authors. Coming out this July from Perseid Publishing! 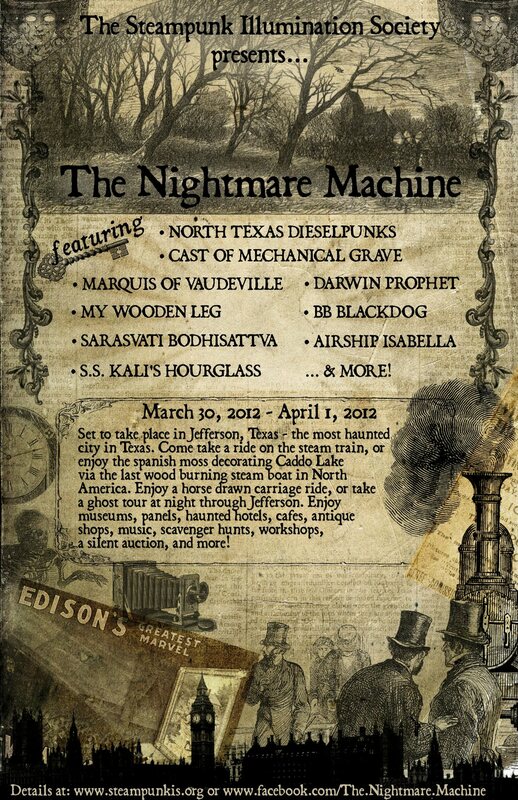 I will be a guest at this paranormal steampunk convention, The Nightmare Machine, this weekend. I will be holding a discussion panel on the history of paranormal investigation Saturday 10:00 AM to 11:00 AM. I am also doing readings Friday night at 8:00 PM from my story “Shadow of a Doubt” which will be published later this year in the horror anthology What Scares the Boogeyman and “Remember, Remember, Hell in November” published in 2011 in the anthology Lawyers in Hell Sunday at 11:00 AM . The convention takes place in historic Jefferson, Texas. Come see me and all the other guests at this fun and exciting event!